Chennai 12th September 2017: Imagine 10,000 runners from South India run for one cause across multiple venues in Chennai, Bangalore, Hyderabad and Mangalore. That’s just what’s set to happen on 24th September @Besant Nagar. 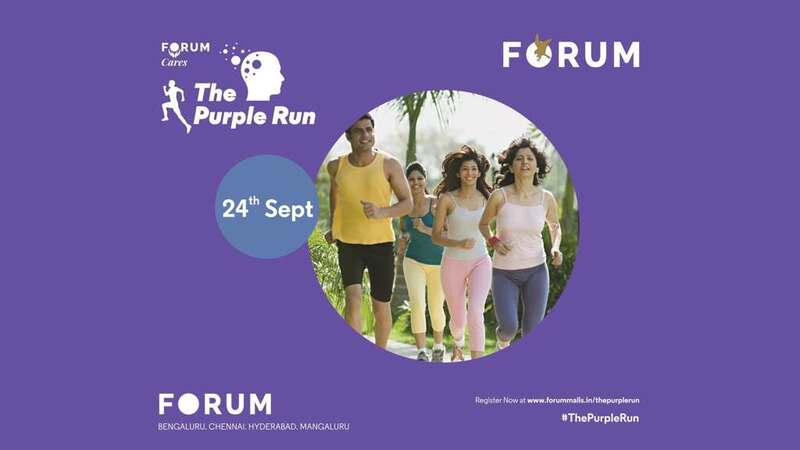 The Forum Mall presents The Purple Run, a signature campaign that will throw light on Alzheimer’s. 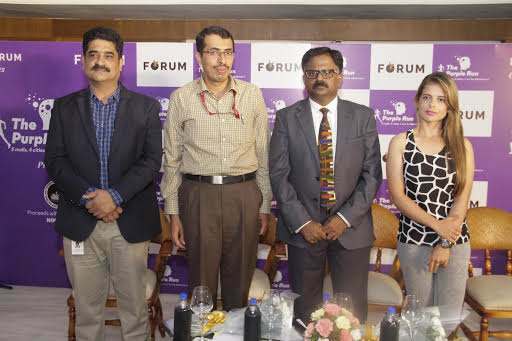 At a time when mental health is ignored and mental illness is looked down upon, The Forum wants to beat the stigma attached with Alzheimer’s as most cases in India go undiagnosed and hence, untreated. The campaign is in line with World Alzheimer’s Day that falls on 21st September. The Purple Run is a competitive half marathon including mini and micro marathons that encourage not just trained athletes but also families and younger ones to participate. The categories are 21 km, 10 km, 5 km and 3 km. The tickets are priced at INR 500 per person. The run is free for children below age 12 (to be accompanied by a guardian) and veterans above 55 years of age. Adding a new meaning to the colour purple that is associated with Alzheimer’s, The Purple Run will flag off from 5 malls and is expected to see participation of 10,000 runners. The marathon is set to flag off at the 5 malls across 4 cities in South India – Bangalore, Chennai, Hyderabad and Mangalore at the same time, at 5:00 am on 24th September. Proceeds from the marathon are being donated to the National Institute of Mental Health and Neuro Sciences (NIMHANS) towards research on diagnosis, treatment and cure of Alzheimer’s. “The prevalence of Alzheimer’s Disease in India is estimated to be around 5 million as of now. The numbers are likely to increase significantly as our demographics ages. The early symptoms of the Alzheimer’s disease are mistaken for normal ageing and there is very little awareness. Some of the risk factors for the disease are modifiable and these are related to obesity, diabetes, hypertension and cholesterol. This provides some hope for early intervention while young. Physical activities like running is good not just for the heart but also for the brain. Though there is no cure, much can be done to improve the life of the sufferers and their care takers. There is need for more awareness, more research and funding for Alzheimer’s. Ever since Alzheimer’s was first recorded in 1906, the disease has eluded many researchers and scientists for over a century. Alzheimer’s is perceived as the most common form of dementia that affects a person’s mind and degrades their basic brain functioning such as memory; cognitive abilities like thinking, behaviour and day to day activities and leads to eventual death by shrinking of the brain over time. According to NIMHANS, in the early stages of dementia, brain image scans may be normal however in later stages, an MRI may show a decrease in the size of different areas of the brain. There has been no definitive prevention or cure. Early identification and treatment could help slowing down the progression of this disease. According to a research conducted by ARDSI, over 6 million Indians are affected by some forms of dementia and by 2020 we may have over close to 20 million. Although there is no cure for the disease itself, it helps when people stand together to support affected people and families. Only through awareness can we accept and understand victims and their families. Buy the best portable speakers for music on the go! Buy the best Action Cameras to capture that moment in an instant! Buy the best accessories to help you stay fit! The best offers on mobile phones!